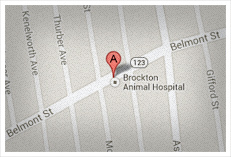 "Brockton Animal Hospital was recommended to me from a family member. I had already been to 2 other consultations on my dogs luxating patella and was told she needed nose and mouth surgery (?) Other reviewers had the same exp where they were told their dogs needed extra stuff done(dedham vet). I will admit I am hard to please when it comes to my dogs. The level of care provided by BAH was impressive! All of the staff members are amazing. They have great communication so you never feel like someone dropped the ball. They will answer all (ALLLL) of your questions and dont BS you about anything. They are upfront and honest people that truely care about the well being of your animals! I can not say enough about how amazing BAH is!!" "They were awesome! They took care of my 6 week old kitten and she's feeling good as new! The staff is so nice and they try to save you money if they can !" "They were and continue to be the best vet for our animals. The care an d consideration is simply the best." "Dr. Hirschberg has been treating my cats since around 1982. There's no place better. The entire staff is kind and concerned. The medical care is state of the art." "I am very pleased with the care and consideration my dog has received at the Brockton Animal Hospital. My dog will be turning 16 soon and can be really skittish but responds very well to Dr. Huffenus. He is very patient and understanding."